It’s your easy weekly ALDI meal plan for the week of 2/17/19: Pick up everything on the shopping list below, then start cooking on Sunday! Check out a few of my ALDI picks this week! My favorite ALDI sales include cheap strawberries (continuing again this week; perfect for Valentine’s Day) — and one of my favorite non-food finds is the Crofton banana hanger with fruit basket… which I look at every darn time it rolls around, and may finally actually buy this go-round. As for my favorite impulse buy? 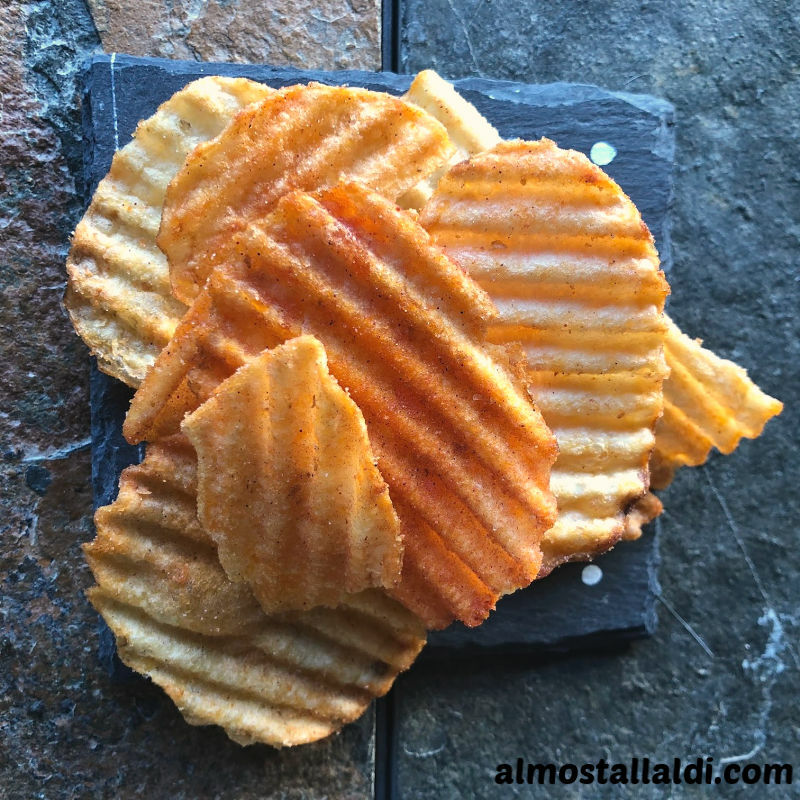 Well, you’re looking at Tandoori Barbecue Potato Chips right here. If you find them in your own store, fair warning: These. Are. Dangerous. Check out my Tandoori BBQ chips review for more. I’m assuming that you already have pantry basics like cooking oil, common condiments, and spices. 🙂 *** Read through the recipes before you shop, to make sure you have the necessary pantry staples on hand for this week’s ALDI menu plan. Sunday: Slow cooker chicken enchilada chili, strawberries, and salad made with half the romaine, two chopped tomatoes, and one chopped avocado. Monday: Sheet pan sausage, green bean, and potato dinner, plus grapes and romaine salad topped with green olives and Parmesan. Tuesday: Vegetarian enchiladas verdes (use yellow and orange peppers), sliced avocado, sliced pineapple. Wednesday: Paprika pork chop sandwiches on Parmesan garlic bread with skillet potatoes & green beans (cut down slightly to use 8 oz green beans and about 1 lb potatoes). Thursday: Italian chicken thighs with zucchini and red potatoes, grapes. Friday: Slow cooker chicken chickpea stew, sourdough toast. Saturday: Leftovers, family pizza night (ALDI sells a nice big take-and-bake pizza), eat out, or date night. Or, maybe less… These meals will likely run you even less if you supplement this week’s ALDI purchases with clearance meat you already have in your freezer, pantry staples you picked up on sale, produce you already have on hand, and/or sale produce from your local produce market. Let me know if you give it a try! 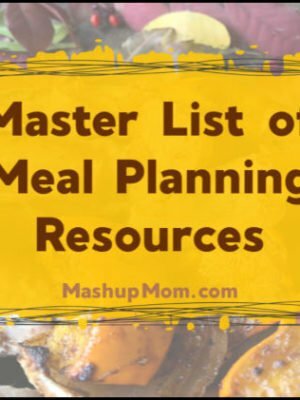 *** Download this week’s printable ALDI shopping list and meal plan in Word format so that you can edit and add in your own meal ideas, remove items you already have on hand, change regional pricing to match your own store, etc. *** The day(s) next to each item show which meals use each ingredient, so that you can easily see what to delete from the shopping list if you’re skipping a night. 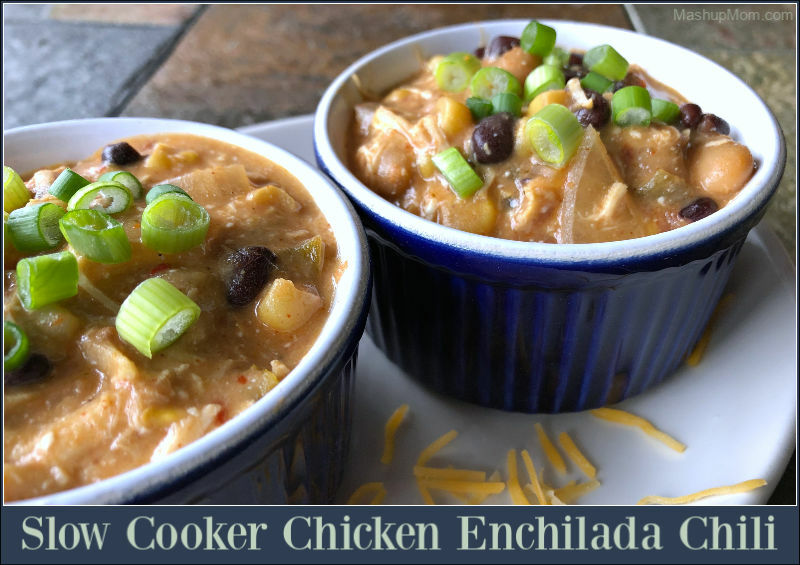 I try not to repeat main dish recipes more often than once a month, but you will see favorite easy recipes come up again in these weekly ALDI meal plans as the same meats and produce items come up again on sale. 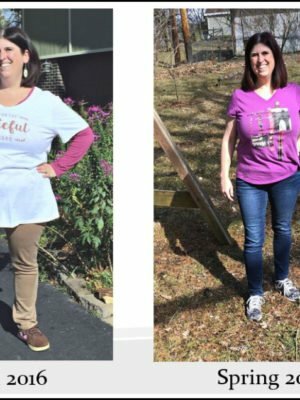 Part of the fun of meal planning lies in mixing old stand-bys with something new each week. If one or more of these recipes isn’t to your taste, or if you have other ingredients to use, you can adapt the recipes in this ALDI meal plan to your family’s preferences — or just use the ideas here to supplement your own meal planning. See: Pantry staples to stock up on and how to modify a meal plan for your family. 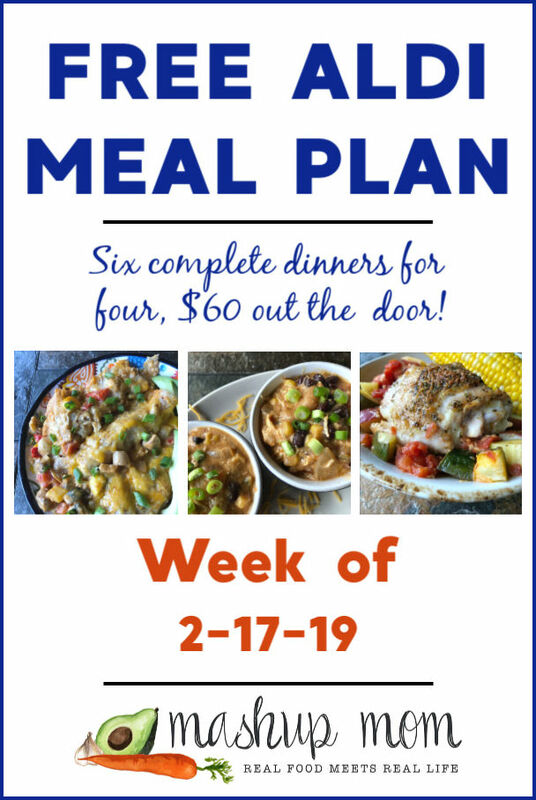 This week’s ALDI meal plan reflects prices from the current week’s ad (running 2/10-2/16 in Sunday ad markets, and 2/13-2/19 in Wednesday ad markets). Non-advertised prices were collected on 2/13/19 at my local store in the Chicago suburbs, but non-advertised prices and produce deals *may vary* by location & region. 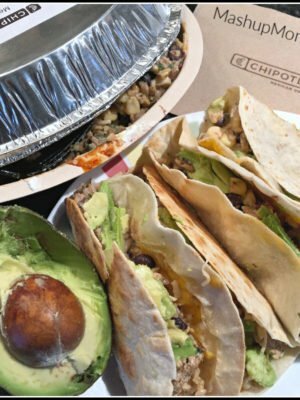 In either ad market, shop any time through Saturday and start cooking on Sunday 2/17/19. Subscribe here to receive weekly email messages about new ALDI meal plans — no spam, just get email notifications about new plans! 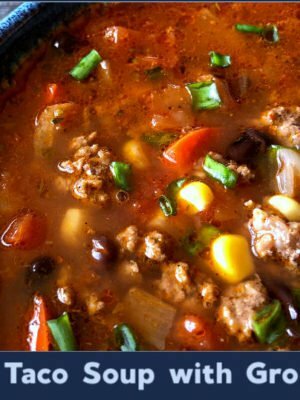 Browse all of the weekly ALDI meal plans here *** note: prices may have changed since originally posted. If you find this meal plan useful, why not share it with your friends on Facebook so they can save money with ALDI meal planning as well? Happy ALDI shopping and cooking this week, everyone! Almost All ALDI — for more ALDI goodness, ALDI finds, reviews, and more. 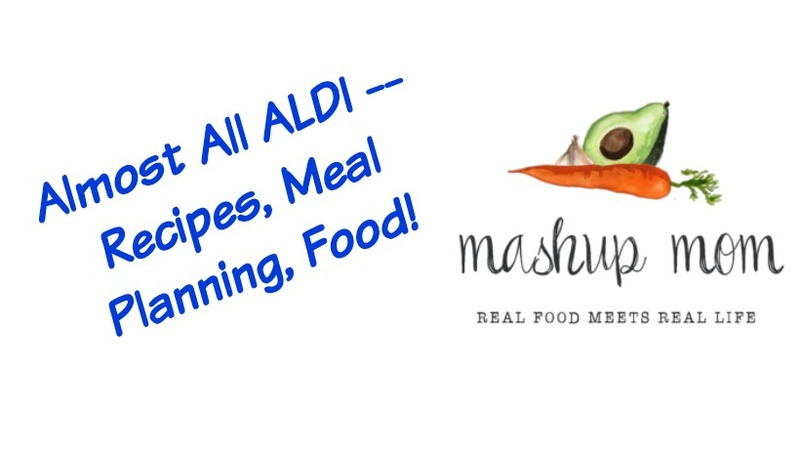 Come join us in the Almost All ALDI Facebook group for recipes, meal planning ideas, ALDI food finds, and more. Pick up a pack of meal prep containers & pack up any dinner leftovers for easy weekday lunches! Cute & handy ALDI quarter keepers. Check out my Amazon shop for some of my favorite useful items for your own meal planning. Also useful: Two pack insulated grab bag totes, or two pack clip to cart bags. Almost All ALDI, the eBook. 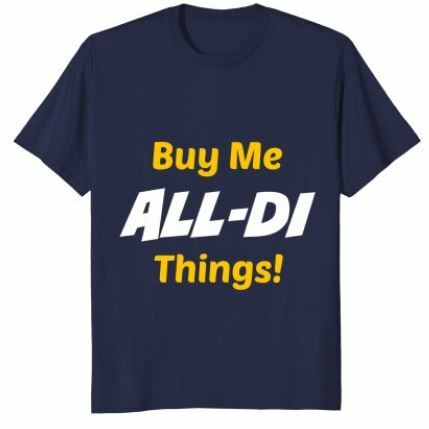 How fun are these ALDI themed t-shirts I have for you guys?! Lastly: You can always access your current regional ALDI ad here. I struggle to think of meals. The paprika pork chop meal is good but it is FAR from a 30min meal….it took about 1hr and 10min from start to finish with a kid assist and attempt to not burn down the house. Sadly it was good but hard to enjoy with little time before kid activity. Plus the hubby bought bone in pork which took time to cut meat off….